Woodland Park Zoo Blog: Chinta the orangutan celebrates her milestone 50th birthday! Chinta the orangutan celebrates her milestone 50th birthday! 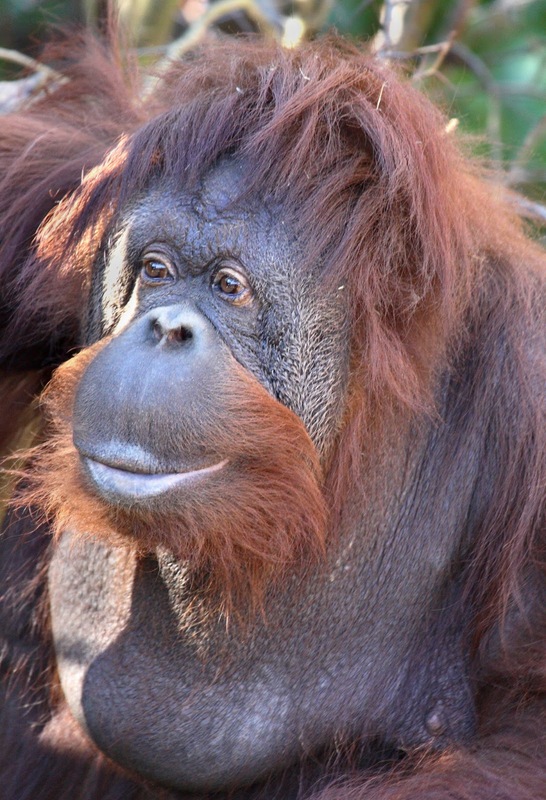 Chinta, our eldest female orangutan, is turning the big 5-0—a cause for celebration! Join us on February 17 for Chinta's birthday bash. The zoo will shower Chinta and her fellow companions with gift-wrapped presents full of favorite treats, streamers and flowers. And, of course, birthday cake! Chef David Van Gelder with Lancer Hospitality, the zoo’s food concessionaire, will bake a ginger-carrot cake fit for an orangutan and loaded with favorite ape ingredients including carrots, sweet potatoes and ginger. Chinta cools off with a shower in summer 2017. Photo by Carolyn Sellar, Woodland Park Zoo. The birthday girl is the oldest animal currently living at Woodland Park Zoo and one of the oldest female orangutans in North America. Save the date for Chinta's birthday bash! Saturday, February 17, 10:00 a.m.–2:00 p.m.
Cake and presents for Chinta: 10:30 a.m.
Birthday activities will take place at the orangutan exhibit located in Trail of Vines. Born at Woodland Park Zoo in February 1968, Chinta is distinguished by ragged bangs gracing her eyebrows and by her sweet personality. Worldwide, she and her late twin brother Towan gained instant celebrity status as the first-known twin orangutans born in a zoo. Photos of the pair as infants appeared around the globe, including in “Life” magazine. While other twins have since been born, twin orangutan births are still a rare occurrence. Towan passed away in 2016. 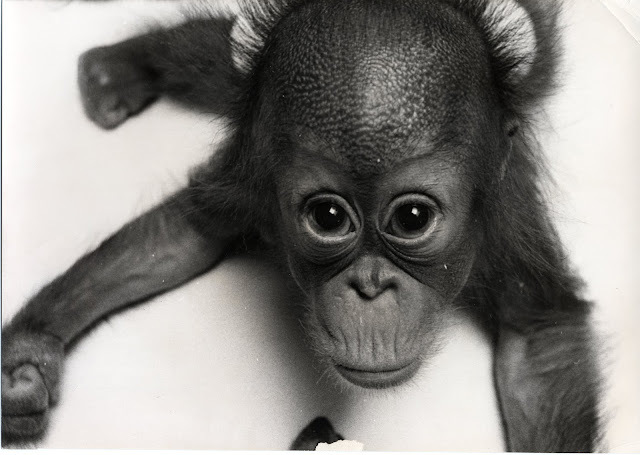 From the Woodland Park Zoo archive. 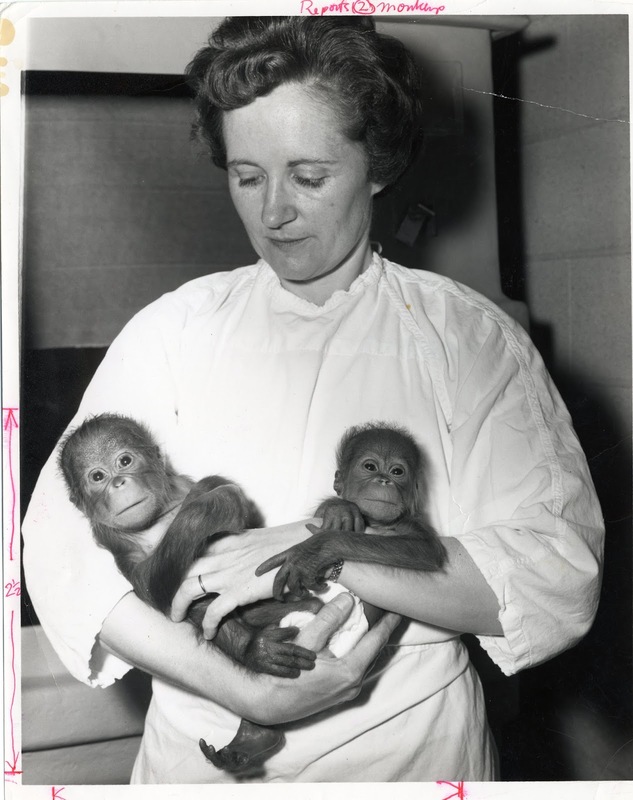 Physicians and nurses from the University Hospital Center for premature infants and University of Washington Regional Primate Center pitched in to care for the infant apes in 1968. Birthday festivities include: complimentary cake pops courtesy of Woodland Park Zoo Board Member Kevin Schofield (while supplies last); a meet ‘n’ greet with animal care staff as they shed light on the quality care program for orangutans and the importance of geriatric care; a photo collage of Chinta; docents with discovery stations sharing fascinating biofacts; and free Chinta collector cards. 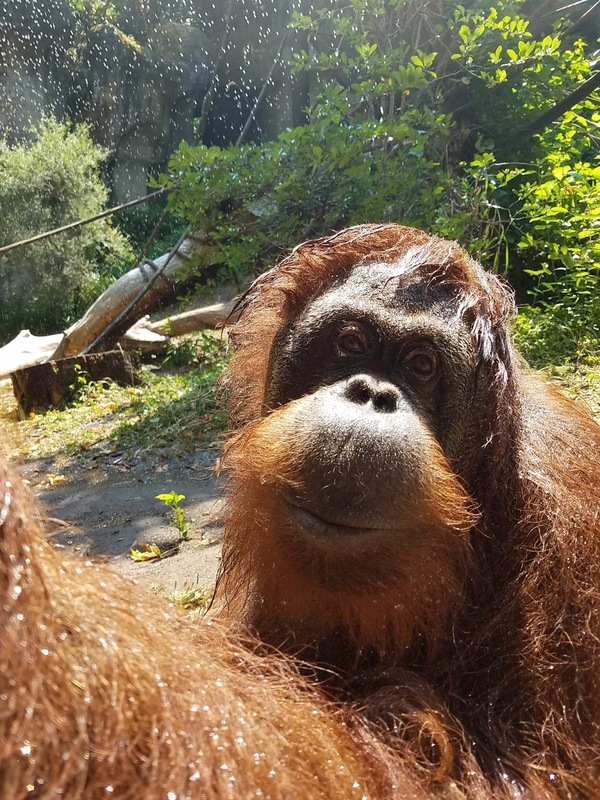 To show love for Chinta and orangutans in the wild, guests are invited to take a palm pledge to choose consumer products that don’t have an adverse impact on tropical rain forests and the animals that live there. In addition, guests can enter a free drawing for a chance to win a commemorative painting created by one of the zoo’s orangutans, an orangutan ZooParent Adoption package and other prizes. From the Woodland Park Zoo archive. 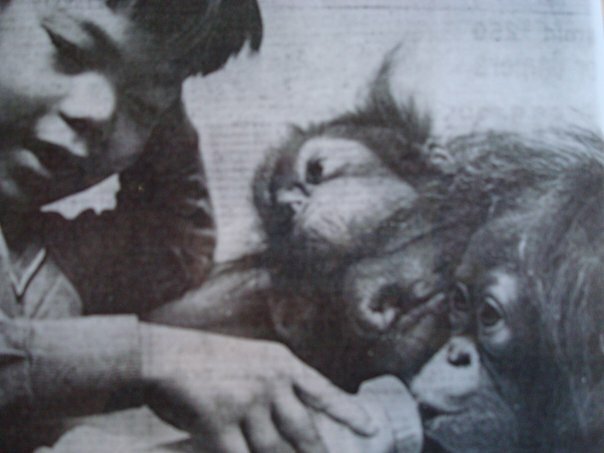 Eric Sano with Towan and Chinta in 1968. A special guest will reunite with Chinta at the birthday party: Eric Sano, who was 6 years old when he named the orangutans in 1968 through a naming contest co-sponsored by The Seattle Times and KVI radio. As the winner, Sano won the privilege to be keeper of the baby orangutans for a day. Today, Sano is a captain with the Seattle Police Department. Chinta hanging int he Trail of Vines in 2008. Photo by Dennis Dow, Woodland Park Zoo. In addition to Chinta, two female orangutans currently live at the zoo: 46-year-old Melati and 36-year-old Belawan, daughter of Towan and Melati. The two males, who happen to have the same birthdays as Chinta, are: Heran, son of Towan and Melati, who will turn 29; and Godek, a Sumatran orangutan introduced last summer to Chinta and Melati, who will turn 9. From the Woodland Park Zoo archives. Towan and Chinta in 1968. Chinta and twin brother Towan were handreared because the mother didn’t know what to do or how to feed them. The twins spent their first several weeks in an incubator converted from a snake enclosure. Since the zoo did not yet have its own veterinary staff, physicians and nurses from the University Hospital Center for premature infants and University of Washington Regional Primate Center pitched in to care for the infant apes. 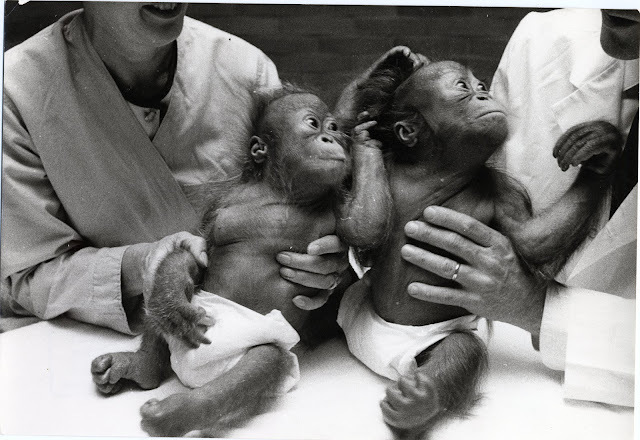 The twins were never reintroduced to their mother; they were handraised by zoo staff and a team of volunteer “babysitter moms” until they were about 5 years old. Animal care practices have evolved, however, and today, there are more options for developing maternal care in adult orangutans or using surrogates, so there is rarely any need for handrearing. 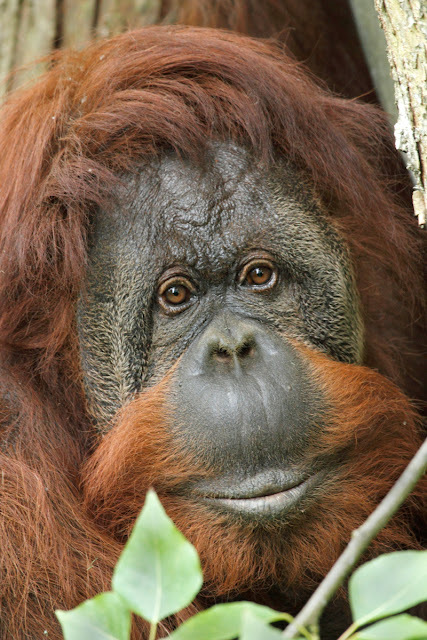 Orangutans, a critically endangered species, belong to the family Hominidae, which includes all four great apes: gorillas, chimpanzees, bonobos and orangutans. There were previously two distinct species of orangutans known—the Bornean orangutan and Sumatran orangutan native to the islands of Borneo and Sumatra in Southeast Asia. Last November, a third species was announced—the Tapanuli orangutan found in Sumatra. Overpopulation, logging, agriculture, conversion of forests to unsustainable oil palm plantations, and other human activities are rapidly destroying forest environments required by orangutans for survival. This palm oil guide can be used to find sustainable, deforestation-free products when shopping: www.zoo.org/palmoil. Learn about Woodland Park Zoo’s partnership with Gunung Palung Orangutan Conservation Project in Borneo, whose focus is to help build a future where orangutans and other wildlife can thrive alongside local villages. From the Woodland Park Zoo archive. Baby Chinta in 1968. HAPPY 50TH BIRYHDAY BEAUTIFUL CHINTA!!! When I was 10 years old, my dad was a Seattle Police Officer and while on duty once, somehow I got a short minute to meet both babies! I distinctly remember Towan reaching out for me, grasping my hand and staring deeply into my eyes. It was magical! I visited about every 5 years as I grew up. When I returned to see him a year or so before his death, we spent over an hour together at the glass, sharing snacks (chew & show). I want to believe he remembered me. When I finally went to leave, he followed me to the end of the enclosure. He passed away on my sons birthday. Happy Birthday Chinta with Love. May peace, good health and happiness be always on your side and on the welfare of your brethren all over the world. Happy happy birthday Chinta-Heran and Godek!